LETTER FROM THE CHAIR It has been an honor and a pleasure to serve as chair of the University of Memphis Board of Trustees for the last two years. It has allowed me to work with a truly visionary leader like President Rudd and with my fellow Board members, who have been unfailingly dedicated to moving the University forward and to carrying out President Rudd’s strategic plan. The creation of an independent governing board allows us to focus solely on the needs of our University. We have seized that opportunity to record a number of remarkable achievements since the Board’s establishment. We have proposed a new simplified tuition structure and lowered tuition for most out-of-state students. In fact, the UofM has had the lowest tuition increases in the State of Tennessee over the last five years. Toward our goal of achieving Carnegie I status, we recently launched the UMRF Research Park in the heart of the University District, which will drive economic development in the region. We also opened a state-of-the-art Metal Additive Manufacturing Lab last fall. Nineteen of our academic programs are now ranked nationally by U.S. News & World Report. Progress is visible on the landscape as well. The Laurie-Walton Family Basketball Center sets the standard for the next generation of athletic facilities. Ground was broken on the Scheidt Family Music Center, which will feature an expansive performance hall and enhancements in technology and acoustics. Our pedestrian cable bridge across Southern and Walker avenues and the railroad tracks is nearing completion, to be followed next year by the Center for Wellness and Fitness, which will focus on student health promotion. The Board has approved several new academic programs, including a bachelor’s degree in commercial aviation. And there are exciting ventures on the horizon: the University is exploring plans for a middle school in the neighborhood. Under an agreement with the Gather on Southern Apartments, we are expanding our housing inventory in a public/private partnership. The first two years have set a precedence for greatness, and I am confident that we will maintain this strong momentum of continuous improvement. I’m looking forward to making even more great things happen at the University of Memphis in the years to come. 2017–19 UNIVERSITY OF MEMPHIS BOARD MEMBERS G. Douglas Edwards Doug Edwards is President of the Edwin M. Jones Oil Company of San Antonio. He was previously the CEO of Morgan Keegan and Company, a division of Regions Financial Corporation. Doug currently serves as Senior Advisor to Brown Brothers Harriman, a Director of Microban International Corporation, a Director of the SIFMA Foundation for Investor Education and Chairman of the Baptist Memorial Healthcare Foundation. The past Chairman of the Teach for America Regional Board, Doug is a University of Memphis graduate and a previous member of its Board of Visitors. In 2008, he was awarded the University’s Distinguished Alumni Award. Marvin R. Ellison Marvin Ellison is Chief Executive Officer of Lowe’s. Before joining Lowe’s in May 2018, JCPenney in November 2014, he spent three years as Chairman and CEO of JCPenney, 12 years as an executive with the Home Depot and 15 years with Target Corporation. Marvin serves on the Board of Directors for the National Retail Federation and FedEx. He is actively involved in philanthropic efforts, including mentoring programs for at-risk youth. Marvin was named to Fortune’s “World’s Greatest Leaders in 2016” and the “2016 Corporate Executive of the Year” by Black Enterprise. He earned a Bachelor’s degree in Marketing from the University of Memphis and an MBA degree from Emory University. Alan B. Graf, Jr Alan B. Graf, Jr is Executive Vice President and Chief Financial Officer of FedEx Corporation. He is responsible for all aspects of FedEx Corporation’s global financial functions and is a member of the five-person Executive Committee. Before FedEx Corporation was formed in 1998, Alan served as Executive Vice President and Chief Financial Officer of FedEx Express. Alan earned his Bachelor’s degree and MBA from Indiana University, where he is a member of the Academy of Alumni Fellows. He serves on the Board of Directors for NIKE Incorporated, Mid-America Apartment Communities Incorporated, Methodist Le Bonheur Healthcare and the Indiana University Foundation. Cato Johnson Cato Johnson has served as Chief of Staff and Senior Vice President of Public Policy and Regulatory Affairs at Methodist Le Bonheur Healthcare since 1985. Active in public service for many years, Cato is former chair of the Tennessee Higher Education Commission and has served the University of Memphis, Southwest Tennessee Community College and Shelby County Schools in many capacities. Currently, he is chairman of the TennCare Medical Advisory Committee and a member of the State Board of Education and Leadership Tennessee – Class IV. Cato earned a Bachelor’s degree and a Master’s degree from Memphis State University (now the University of Memphis). Brad Martin Brad Martin is Chairman of Chesapeake Energy, Chairman of RBM Ventures, and Retired Chairman and CEO of Saks Incorporated. During the 2013–14 academic year, Brad served as the Interim President of the University of Memphis. He served five terms as a member of the Tennessee House of Representatives, and is involved in several civic and philanthropic activities. Brad graduated from the University of Memphis where he served as president of the student body. He earned an MBA from the Owen Graduate School of Management at Vanderbilt University and was awarded an honorary Doctor of Letters from the University of Memphis. David A. North Dave North is President and CEO of Sedgwick and has over 32 years in risk management services. Dave has served on the board of the Worker’s Compensation Research Institute, is past Chairman of the board of the Integrated Benefits Institute and is a member of the Business Insurance Women to Watch Advisory Board. Dave is the director for The Institutes, the leading provider of professional education for the risk management and property-casualty insurance industry. Dave previously served on the University of Memphis Board of Visitors and concurrently serves on the Foundation Board and the UofM President’s Innovation Board. Carol Roberts Carol Roberts is a retired Senior Vice President and Chief Financial Officer for International Paper. Carol leads the global finance organization, including Internal Audit, Tax, Accounting, Trust Investments, Investor Relations, Treasury and Strategic Planning; and Information Technology. Carol joined IP after earning a Bachelor of Science degree in Mechanical Engineering from Yale in 1981. She has held numerous positions in manufacturing, operations, human resources and general management. Carol serves on the Yale University Council, which advises the Yale president on key academic and administrative issues. Carol also serves on the Board of Directors and is Chair of the Audit Committee for Alcoa. Susan L. Springfield Susan Springfield is Executive Vice President and Chief Credit Officer for First Horizon National Corporation and First Tennessee Bank. She is an executive sponsor of First Horizon’s Inclusion and Diversity Council and their Women’s Initiative. Susan is a board member for the Family Safety Center and Streets Ministries. She is a past board member for Hutchison School, SRVS, Le Bonheur Foundation, Rise Foundation, the Women’s Foundation and is a 2002 Leadership Memphis graduate. Susan earned her Bachelor’s degree in Management and her MBA in Finance from the University of Memphis, and completed the Wharton School of Business Advanced Risk Management Program. LETTER FROM THE PRESIDENT For many years, the University of Memphis argued that an independent Board of Trustees would have significant impact on both the University and the broader community. If anything, the past two years have demonstrated that might be an understatement. The new Board structure has provided the UofM the freedom, flexibility and outside expertise needed to move forward in unparalleled fashion. The collection of initiatives summarized is not only impressive, but profoundly impactful. We have significantly improved student retention, persistence and graduation. Support for both students and faculty research expansion are at unprecedented levels. Weâ&#x20AC;&#x2122;re the only public university in Tennessee to provide paid parental leave and are actively working to provide more educational options from infancy through high school. Although we have a long way to go, weâ&#x20AC;&#x2122;ve implemented two significant increases to our base hourly wage. Our corporate partners are not only world leaders, but their generosity is improving the lives of our students and making our community a better place. The past two years have been good ones. We have built remarkable momentum and have every intention of maintaining it in the coming years. I want to thank our Trustees for their expertise, selfless service to our community and remarkable generosity. Go Tigers! PROGRESS IN THE FIRST TWO YEARS UofM OFFERS PAID PARENTAL LEAVE The University of Memphis Board of Trustees approved a six-week, paid parental leave policy. With this implementation, the UofM becomes the first public higher education institution in the State of Tennessee to offer paid leave for new parents. The policy will offer six weeks paternal or maternal leave for faculty and staff adopting or having a biological child. This policy is monumental in the University’s strides to recruit and retain young professionals and be recognized as family friendly. FOOTBALL WILL GET NEW INDOOR PRACTICE FACILITY As part of the Time to Shine Campaign, the UofM will open a new indoor football practice facility on the Park Avenue Campus. It will include a 120-yard, top-of-the-line artificial turf practice field with goal posts, coaches’ offices and spaces for enhanced student-athlete academic, nutrition and athletic development. CAMPAIGN SHINES LIGHT ON TRACK AND SOCCER COMPLEX The Time to Shine Capital Campaign is shedding light, literally, on the University of Memphis soccer programs. The UofM announced a $500,000 project to light the Billy J. Murphy Track and Soccer Complex. The Time to Shine campaign started in 2013 and will conclude with the return of Memphis men’s and women’s soccer matches to the UofM Park Avenue Campus. FEDEXPARK GETS ADDITION Originally opened in 2010, FedExPark underwent further development in 2017–18. The Tigers opened a 1,600 square-foot addition to the W.S. “Babe” Howard Training Facility attached to FedExPark for the 2018 season. The expansion, which was made possible by the generosity of Ray and Laura Rosas along with other private donors, includes a team meeting room and additional coach’s offices. With the additional office space, the Tigers will be able to have their entire coaching and support staff in the same building. PATTERSON STREET PROJECT WILL INCREASE SAFETY The Patterson Street Realignment Project will make it easier to negotiate the five-way stop on Patterson. It will be completed by the City of Memphis and has 20 percent financial input from the UofM. The work includes aligning the street with the existing railroad crossing and relocating the existing parking from the west side of the street to the east side of the street. No parking will be lost, but it will be more accessible and safer. The street will have a center median and planted verge strips with new sidewalks and lighting. OFFICE OF TECHNOLOGY TRANSFER CELEBRATES RECORD NUMBER OF PATENTS The Office of Technology Transfer (OTT) hosted the 2017 University of Memphis Inventor Celebration to honor and recognize those who have received patents for their inventions and/or intellectual property during the last year. The celebration culminated an extraordinary year for the University, receiving a record 10 patents â&#x20AC;&#x201D; an achievement that highlights the research capabilities at the UofM. UofM BREAKS GROUND ON SCHEIDT FAMILY MUSIC CENTER The University of Memphis broke ground on the new Scheidt Family Music Center, a 40,000-sq. ft. music center that will allow the UofM to immediately increase student recruitment and grow the pool of UofM music graduates. The state-of-the-art facility will double the size of the current Rudi E. Scheidt School of Music, and feature an expansive performance hall and significant enhancements in technology and acoustics. Dedicated tailored laboratories for innovation and artistic expression will allow faculty to structure the educational experience to best serve students. UofM OPENS NEXT GENERATION OF BASKETBALL FACILITIES The Laurie-Walton Family Basketball Center on the Park Avenue campus of the University of Memphis features the latest in amenities, technology, studentathlete involvement and even fan engagement. The facility is the primary home of the Tiger menâ&#x20AC;&#x2122;s basketball program and sets the standard as the next generation of facilities. The newly-built center includes the normal practice facility amenities, including practice gym, locker room, coachesâ&#x20AC;&#x2122; offices and training facilities. However, what sets the Laurie-Walton Family Basketball Center apart from its predecessors is the commitment to donor and VIP cultivation, a public Hall of Traditions, academic support for multiple teams, state-of-the-art training facilities, enhanced technology and connectivity throughout the building and a practice court that is significantly larger than the normal size. ROSE FAMILY FOUNDATION COMMITS $1 MILLION TO NATATORIUM RENOVATION PROJECT The Rose Family Foundation has made a $1 million commitment to the University of Memphis Natatorium Renovation Project. The Foundation is partnering with the UofM to secure $10 million to renovate its natatorium, which is used by Memphis Tiger Swimming, Splash Mid-South and the UofM community. Drowning is a leading cause of death among children ages 1-4. African-American children ages 5-19 drown in pools at a rate 5.5 times higher than that of white children. Since the closing of the YMCA on Walker Avenue in 2011, there have been few options available in the University area for swim lessons and drowning prevention training. In addition, Memphis does not have a swimming facility that can accommodate swimming and diving competitions. NINETEEN UOFM PROGRAMS RANKED NATIONALLY BY U.S. NEWS & WORLD REPORT. The University of Memphis has 19 academic programs currently ranked nationally by U.S. News & World Report in its Best Graduate Schools, including three in the Top 25: Audiology (No. 17), Rehabilitation Counseling (No. 21) and Speech-Language Pathology (No. 24). The other ranked programs are: Health Care Management (No. 47), Social Work (No. 88), Clinical Psychology (No. 102), Earth Sciences (No. 111), Fine Arts (No. 114), Math (No. 127), English (No. 133), History (No. 134), Public Affairs (No. 135), Law (No. 137), Engineering (No. 145), Psychology (No. 148), Education (153), Nursing (No. 155), Part-Time MBA (No. 163) and Biological Sciences (No. 190). UofM PARTNERS WITH FOLDS OF HONOR The University of Memphis is the first institution of higher learning nationally to partner with Folds of Honor to support higher education for spouses and children of Americaâ&#x20AC;&#x2122;s fallen and disabled service members. The UofM is accepting the Folds of Honor scholarship ($5,000 annually with the addition of private donations and other support funds to cover the financial gap) as payment in full for tuition for all Tennessee residents and others around the country in accordance with capacity. TRUSTEES APPROVE NEW PROGRAMS The Board of Trustees have approved eight new programs to expand the academic offerings available from the UofM. The following new academic programs have been approved by the Board of Trustees and the Tennessee Higher Education Commission (THEC): PhD in Nursing (Loewenberg College of Nursing), Doctor of Liberal Studies (University College), Master of Science in Biostatistics (University College) and Bachelor of Science in Commercial Aviation (University College). Additionally, the following programs have been approved by the Board of Trustees, but are pending approval by THEC: PhD in Urban Affairs (College of Arts and Sciences), Doctor of Physical Therapy (School of Health Studies), Doctor of Social Work (College of Arts and Sciences) and Master of Science in Engineering Management (College of Engineering). UMRF VENTURES OPENS COMMAND CENTER, CALL CENTERS UMRF Ventures, a wholly-owned subsidiary of the University of Memphis Research Foundation, has hired 45 UofM graduate students primarily specializing in science, technology, engineering and mathematics (STEM) to work on campus with FedEx IT employees from their IT Command Center Team. The result of this collaboration is a UMRF Ventures-operated FedEx IT Command Center - Systems Analytics Group which opened last summer at the FedEx Institute of Technology on campus. UMRF Ventures also operates two IT Call Centers, one on the main campus and one at UofM Lambuth. Students earn a good salary and gain real-world experience providing FedEx team members with first-level technical support. By the end of its second year, itâ&#x20AC;&#x2122;s projected that UMRF Ventures will employ 300 students. UofM LAUNCHES RIVER CITY PARTNERSHIP The River City Partnership, a collaboration between the University of Memphis, Shelby County Schools and the Achievement School District, was created. The River City Partnership is an umbrella initiative intended to strengthen the teacher pipeline by introducing high school students to a possible career in education, preparing teachers at both the undergraduate and graduate level and implementing retention strategies for new and existing teachers. RECORD YEAR FOR FUNDRAISING The University of Memphis secured a record $23,145,635 in academic commitments during the fiscal year that ended June 30, 2018, surpassing the previous record of $21,080,174 achieved in fiscal year 2015. The total includes gifts of cash, pledges and planned gifts from alumni, friends, corporations and foundations to the University of Memphis Foundation. Private contributions impact the lives of our students and improve the educational experience at the University of Memphis. UNIVERSITY COLLEGE ADDS COMMERCIAL AVIATION DEGREE PROGRAM The University College partnered with Crew Training International (CTI) Professional Flight Training to launch a new Commercial Aviation program in fall 2018. “The Commercial Aviation Degree program is one of many steps the University of Memphis is taking to better prepare students for 21st century jobs,” said President M. David Rudd. “The opportunity to collaborate with Millington’s Crew Training International Professional Flight Training will not only build a superior education program for our students, it will also better position our aviation graduates for future opportunities with FedEx. FEDEX LIFE PROGRAM OFFERS OPPORTUNITY FOR TUITION-FREE DEGREE FedEx Express and the University of Memphis established the Learning inspired by FedEx LiFE program, a new initiative that allows employees of the FedEx World Hub the opportunity to earn a tuition-free, fully-online degree from UofM Global. LiFE: Learning inspired by FedEx is a unique initiative that provides FedEx Hub employees in Memphis, Tennessee; Indianapolis, Minnesota; Los Angeles and Oakland, California; and Newark, New Jersey the opportunity to earn a bachelor’s degree through the University of Memphis online program, UofM Global, at potentially no cost to the employees. As long as students remain in good academic standing and are employed at the FedEx Hub, tuition expenses will be directly billed to FedEx. LARRY FINCH PLAZA PLANNED Larry Finch Plaza, which will include a statue of the late former Memphis Tiger All-American, assistant coach and head coach, will be located at a site to be chosen on the University of Memphis campus. A committee has also been appointed to plan the project. Finch, who had his No. 21 jersey retired on Nov. 30, 1974, competed in more than 500 games in 25 years as a player and coach for the Tigers. Finishing his three-year playing career from 1970–71 to 1972–73 as the school’s all-time leading scorer with 1,869 points, Finch is currently ranked fourth behind Keith Lee, Elliot Perry and Rodney Carney. His 22.3 points per game career average remains a Memphis record. UofM AMONG THREE UNIVERSITIES TO SHARE $5 MILLION NSF STEM GRANT The University of Memphis is one of three urban universities to receive a portion of a $5 million grant from the National Science Foundation’s (NSF) Scholarships in Science, Technology, Engineering and Mathematics (S-STEM) program. The grant will support the Urban S-STEM Collaboratory project, which brings together the UofM, the University of Colorado at Denver and Indiana University-Purdue University Indianapolis to provide academic, social, professional and peer networking; career preparation; and scholarship support to approximately 150 engineering and mathematical sciences majors across the three institutions. The UofM Herff College of Engineering, College of Arts & Sciences and College of Communication and Fine Arts will collectively receive $1.7 million for the project, $1 million of which will be dedicated to scholarships. UofM MAY ADD OSTEOPATHIC MEDICINE SCHOOL AT LAMBUTH The UofM is exploring the feasibility of adding a doctor of osteopathic medicine school to the UofM Lambuth Campus in Jackson, Tennessee. President M. David Rudd said the school would be a natural fit for Jackson, where there is a significant need for rural health care. Students who earn a doctor of osteopathic medicine degree are fully licensed physicians who focus on primary care and wellness. NEW SIMPLIFIED TUITION STRUCTURE Most out-of-state students at the University of Memphis will have a sizable cut in tuition under a simplified four-tier tuition structure approved by the Board of Trustees in September 2018. The restructuring sets tuition for Tennessee residents, out-of-state residents, international students and UofM Global (online) students. Under the new system, students from outside a 250-miles radius of the UofM will see a considerable decrease in costs. The changes will significantly reduce the amount above in-state tuition that students from around the country have to pay. UofM HAS LOWEST TUITION INCREASES IN STATE OVER LAST FIVE YEARS The University of Memphis has the lowest total tuition and fee increases in the State of Tennessee over the past five years by a substantial margin at 11.9 percent. The UofM is the only public institution of higher education in Tennessee to not have a tuition increase in two of the last five years, and has the lowest rate of average tuition increase (1.7 percent) over the last five years. The UofMâ&#x20AC;&#x2122;s average tuition increase has been 1.7 percent, compared to 7.4 percent over the previous decade and a half. TRUSTEES APPROVE EXPLORATION OF NEW MIDDLE SCHOOL The Board of Trustees granted authority to explore creation of a middle school for the University at the former St. Anne Catholic School at Highland and Spottswood at its December meeting. The Board also approved the lease of vacant grounds at UofM Lambuth to build a new public high school. The Shelby County School Board approved the Middle School on Feb. 26, 2019, making this the third University-sponsored school. TRUSTEES APPROVES TUITION TRANSPARENCY AND ACCOUNTABILITY ACT The University of Memphis Board of Trustees approved a Tuition Transparency and Accountability Act — a policy to establish guidelines for considering increases in tuition and mandatory fees — at its meeting in December 2018 at UofM Lambuth. PEER POWER FOUNDATION OPENS ON CAMPUS The University of Memphis and Peer Power Foundation have opened the Peer Power Institute on the University of Memphis campus. Peer Power Foundation is a Memphis-based nonprofit that hires high-performing college students to tutor and mentor Shelby County Schools students. UofM LAUNCHES RESEARCH PARK The University of Memphis is strengthening its role as a research-based driver of economic development in the region with the establishment of a research park in three phases. Phase One is the opening of the first facility in the heart of the University District. Phase Two will be the development of an applied research facility located on the Park Avenue Campus later this year. Phase Three will center on publicprivate partnerships to attract research enterprises and labs to the University District. 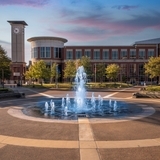 The development of the research park is being spearheaded by the University of Memphis Research Foundation, which is operating the facilities and services. FIVE UofM GLOBAL PROGRAMS RANKED NATIONALLY BY U.S. NEWS & WORLD REPORT Five UofM Global programs are ranked nationally by U.S. News & World Report, including Nursing (graduate), No. 17; Criminal Justice (graduate), No. 43; Online Bachelorâ&#x20AC;&#x2122;s Program, No. 58; MBA, No. 70; and Education (graduate), No. 139. The publication ranks eight online programs annually. SUDER FOUNDATION GIFT SUPPORTS FIRST-GENERATION STUDENT SUCCESS The University of Memphis received a total of $1.4 million in private support from the Suder Foundation and an anonymous donor to create the Office of First Generation Student Success (OFGSS) and establish an endowed scholarship fund for first-generation students. The OFGSS will expand existing programs for first-generation students and create new programs in collaboration with partners across campus. UofM MOVES FORWARD ON AGREEMENT TO MANAGE GATHER APARTMENTS The University of Memphis Board of Trustees approved a request by the UofM to move forward with an agreement with Municipal Acquisitions to manage and eventually acquire the Gather on Southern apartments at a special called meeting. The endeavor — the first of its kind by a public university in the State of Tennessee — will allow the University to expand its housing inventory in a public/private partnership. UNIVERSITY NEARS COMPLETION ON LAND BRIDGE The UofM is nearing completion on the muchanticipated pedestrian land bridge, amphitheater and general access parking garage. The land bridge will link the north and south sections of the campus. Once completed, students will be able to walk across Southern and Walker avenues and the railroad tracks. The $30 million Center for Wellness and Fitness will soon follow. The project will feature a new 74,000 sq. ft. building with an academic focus offering holistic wellness and fitness opportunities that are integrated into the University’s core academic mission. Combined with renovations to the existing recreation center, it will provide 225,000 sq. ft. of wellness and fitness space. CURRENT RANKINGS In our world, numbers matter. We were recently ranked as the No. 1 online college in the state of Tennessee. In fact, almost a third of our programs are nationally-ranked in the top 40. Even more rank in the top 100. We have 21 undergraduate and 21 graduate programs ranked nationally. We can debate the value of these rankings, but one reality is clear: students and parents use these rankings when making decisions about graduate and undergraduate programs. 1. 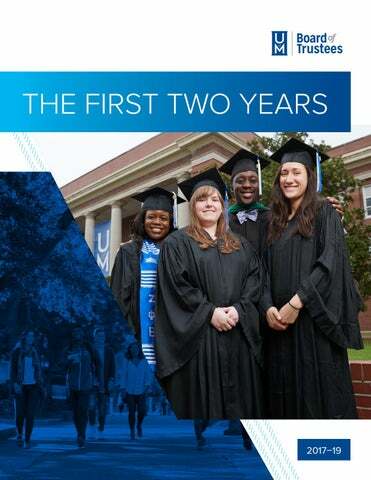 This report shows the accomplishments of the University of Memphis during the first two years of the newly established Board of Trustees.